Please note: This is a past issue. Pay-what-you-want funding is only donated for current issues. 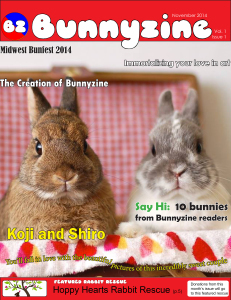 If you choose to buy this issue, you are supporting Bunnyzine and not the featured rescue for this issue. Your pay-what-you-want amount is a purchase for the issue. It is purchase-transaction and not a donation and, on this basis, I cannot offer a tax receipt. Bunnyzine will be making a donation of this money once the December 31st, 2014 date has passed. If you wish to contribute money to Judge’s Park Small Animal Rescue directly , please visit their website. This is a digital PDF file. Please ensure that you have software that reads PDFs before ordering. The month this was featured has passed. 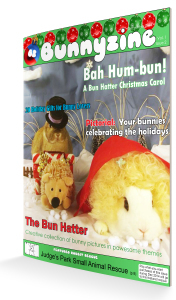 If you purchase this issue, the purchase amount will go to Bunnyzine. This is a digital interactive PDF file. Please ensure that you have software that reads interactive PDFs before ordering. This is a Pay-what-you-want issue. Your purchase amount will go to Bunnyzine. If you wish to contribute to Hoppy Hearts Rabbit Rescue, please visit their website to donate directly.